Our passion is real estate and we take a unique approach to connecting property owners with buyers and tenants. From our attention to detail to our focus on high quality customer service Hamilton May gives you the competitive advantage. Hamilton May real estate is part of Hamilton May limited partnership, a company with a comprehensive coverage of the Krakow property market – providing our clients and investors with a one stop solution to all your Krakow real estate needs. Hamilton May specialises in sale and purchase of residential Apartments in Krakow, commercial property, land, off plan developments, Krakow apartment rentals, buy to let, flats, for both private individuals and for companies and is experienced in dealing with clients from Poland or overseas in either Polish or English. Since its establishment in 2004 in Krakow, Poland, Hamilton May real estate has focused on maintaining high standards, not only in the quality of its property portfolio, but also in customer service and client relationships. 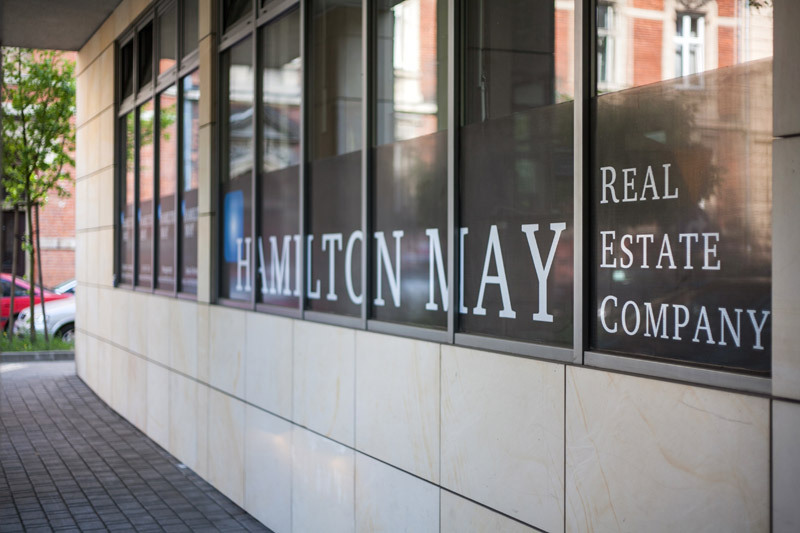 Hamilton May’s long term philosophy to client relationships has developed a loyal client base and frequent word of mouth referrals together which have lamented HM’s reputation as Krakow’s foremost quality real estate broker. Hamilton May’s client base includes commercial, business and corporate let clients (HSBC, IBM, Cap Gemini, Zurich, Google, Shell, PwC) in addition to a significant number of private individuals. Hamilton May services local clients from Poland, in addition to English speaking international clients, in which it has a long track record in helping from its roots as a consultancy service, specialising in helping foreign investors source property in Poland, and more specifically Krakow. Hamilton May real estate sells and rents high standard properties based primarily in the centre of Krakow up to a maximum distance of approx 4 km, although most listed apartments and houses for sale and rent are located within 2km of the main square. Properties offered tend to be of high end and luxury standard largely owing to the desirable central locations. The sales market in the city centre is characterised by off plan developments of old buildings (with a limited number of new build apartments) and a steady supply of secondary market properties. The rental market offers flats, apartments and office space either fully furnished or unfurnished, with amenities such as private parking, security, air conditioning only typically in short supply and available in new builds such as Angel Plaza, Angel city, Wislany Tarasy. Hamilton May has access to a sizable database of property for sale and rent in Krakow at any one time, sourced directly though it’s established client network and through efficient co-operations with other Krakow realtors. HM are careful to review criteria such as, price, size, number of bedrooms etc, before starting a property search on behalf of a client. A focussed search combined with a large portfolio frequently results in a successful search, saving the client time and money – a value add that can not be offered by some of Krakow’s smaller sales and letting agents. For rental purposes, HM is able to offer short term serviced apartments as well as long term rentals through its partner activity Hamilton Suites and can also manage long term serviced apartments for company rentals. We are also able to offer apartments for rent in Warsaw and a large portfolio of apartments for sale in the capital. Stay up to date with the real estate market. Hamilton May present news, analysis and comments written by our professional team.